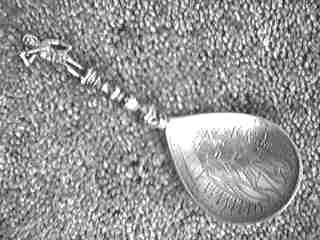 Apostle spoons are one of the oldest form of silver spoons available. The finial is designed in the shape of one of the 12 apostles, although the specifics of each apostle vary from culture to culture. 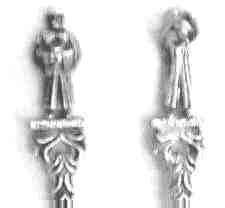 Some apostle spoons have been dated to the 1500's but those are exceedingly rare. 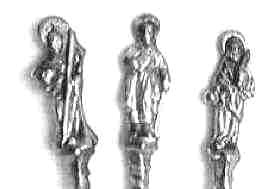 Only two complete sets of 13 apostle spoons from the early 1500's are known to exist in the entire world and one is a "re-assembled set", meaning that the set had been broken up over the succeeding generations and it was re-assembled in the first part of this century due to some great silver sleuthing. Several later sets are known to exist, but these are also extremely rare and valuable. For the most part, these spoons were made individually. 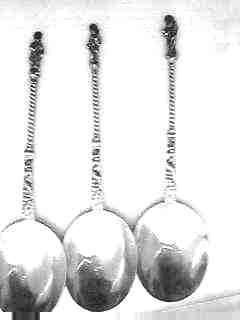 Wealthy grandparents would buy one spoon representing a babies "apostle" and it would be their Christening present. This spoon would be used only by that person and it would be kept for life. Consequently most of the old apostle spoons show considerable wear (note pictures), both at the finial and at the bowl. 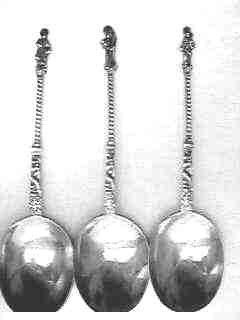 The phrase "to be born with a silver spoon" stems from this tradition. 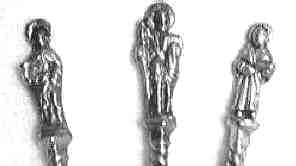 There is a wide variety of apostle spoons that were made from the 1500's to modern times, but I am not an avid collector of these pieces, so I can only show a few. Several different companies have made sets of these spoons since the beginning of this century including the Franklin Mint in the 1970's. 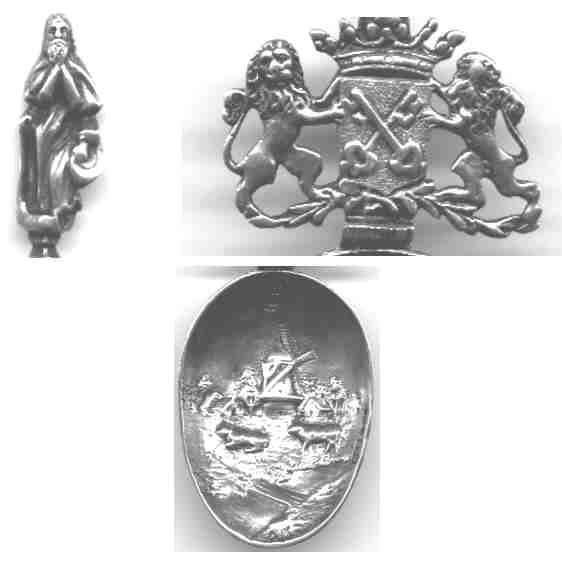 Also a number of sets of silver plated pieces from England are readily available. The individual apostles may sometimes be identified by what they are holding. Near the bottom of this page is a list of some of the common associations. This group of six pieces is marked with a Nuremberg, Germany mark and is believed to date to the late 1700's. In fairness, it is important to state that old Nuremberg marks were reproduced during the late 1890's by antique reproducers. See the discussion on this at Victorian Era Reproductions. I thought that this piece was rather unique until I found a second. It is unusual in that it is a mechanical spoon. In the spoon on the left the cup is held at stomach level, but when the spoon is turned over, the cup and arms move to the mouth level (right photo). The finials on both spoons are the same, but the bowls are hand pounded and are different. These spoons are from "Rothenburg", Germany. This large 7.5" apostle spoon was made in Augsberg, Germany using sterling silver, so it was intended for export. While the spoon looks like it is several hundred years old, it was made in the late 19th or early 20th century. The spoon has a series of German marks, and a series of simulated British marks, but I suspect that it was made for the American market. Details of the spoon are shown below. The bowl is all handworked and shows a rural pastural scene with contented cows etc. This spoon has a apostle finial and it is marked with an old French purity mark that dates back to the late 1700's or early 1800's. It has a very long stem with twisted center and a small "stirrer" style bowl. According to Dorothy Rainwater, this is a Swiss Apostle spoon. It is marked with an "O and a D" in separate touches in the bowl. I have been unable to identify the marks and have no idea as to its age or metallic purity. I have just acquired this 19th century reproduction of a 16th century (1571) Norwegian Baptismal/Apostle spoon made for a king. This sterling silver (handle) with 830 silver quality bowl is hand made and very finely chased in the old style. Since it is not possible for a private collector to have the original of such a piece, this high quality reproduction is the best that is available to a collector. Each apostle figure can sometimes be identified by the attribute held in his right hand. * Christ, blessing with right hand, a cross in the left. * St. Andrew, saltire or X shaped cross. * St. Bartholomew, butcher or flaying knife. * St. James the Greater, pilgrim's staff. * St. James the Lesser, fuller's bat or club. * St. John, chalice or cup. * St. Jude, carpenters square or cross. * St. Matthew, money bag or axe. * St. Peter, key or fish. * St. Philip, staff with a cross on the end. * Judas Iscariot is usually replaced by St. Paul (sword), St. Matthias (halberd) or St. Mark (lion). The tradition of giving baby spoons extends to our own times. Since the influence of the Church is not as great as it used to be, many of these spoons are more generic. Some pictures can be seen in the Ceremonial and Baptism spoon exhibit.